A narrower sole, beveled trailing edge, chamfered topline and high toe produce a more traditional look that appeals to the highly skilled player. A shorter blade length and minimal offset offer enhanced workability. The heel design helps reduce turf drag through the rough, while the longer hosel helps strategically position the center of gravity (CG) for optimum trajectory control. Redistributes even more weight to the perimeter of the iron to create a high moment of inertia (MOI) for greater forgiveness and more stability. 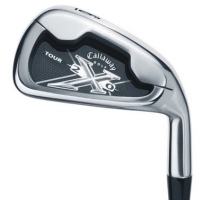 A patented Callaway Golf technology that maximizes perimeter weighting by moving the CG lower and farther back in the clubhead, enlarging the hitting area and stabilizing the clubhead for more forgiveness.